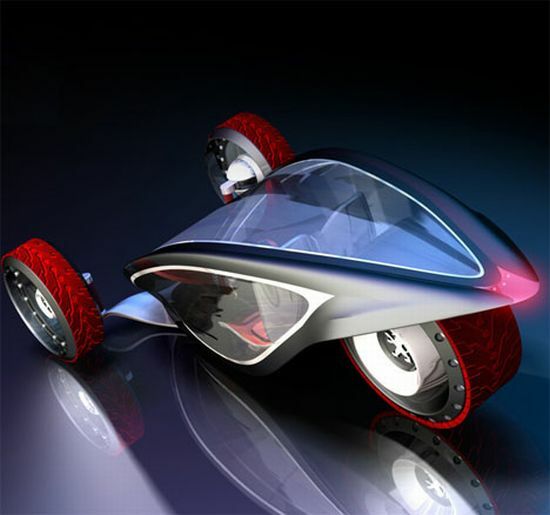 The concept of futuristic cars has been around for some time now. 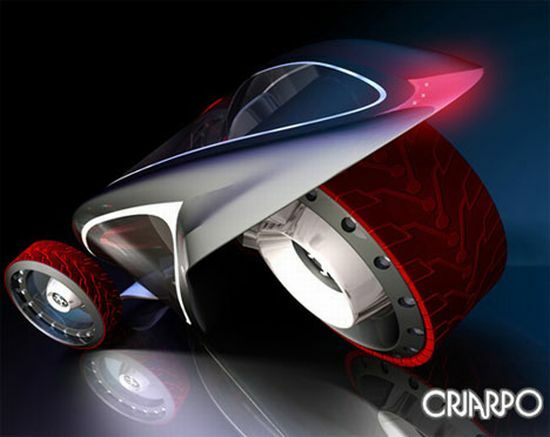 Roger that the new upcoming generation of automobiles is what we are talking about here. Well, this is more a sort of an economic movement towards making our environment a better place to be in. 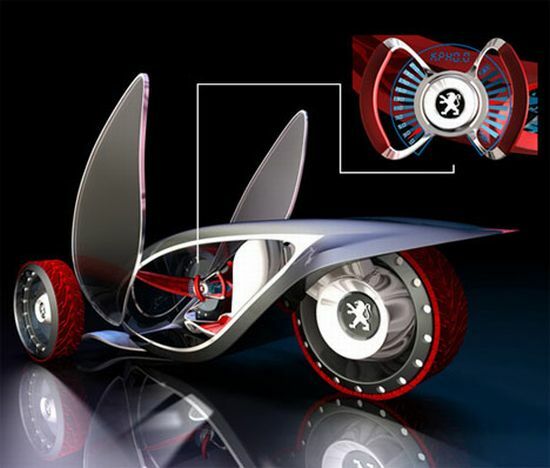 Guess this is exactly why designer Cristian Polanco has come up with the Peugeot Aureon concept, an electric car for commutation in the future. 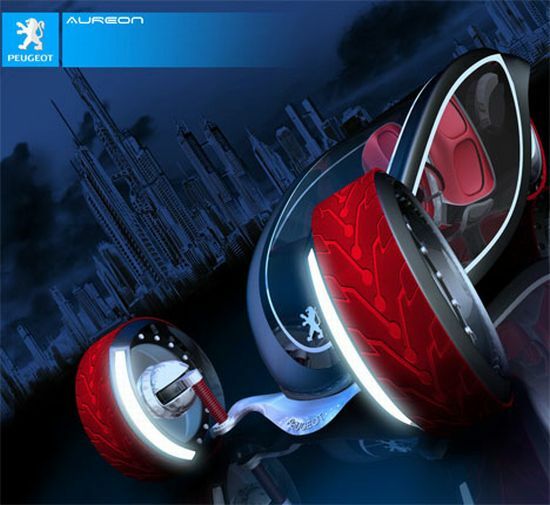 A perfect roadster for all the car fanatics out there, the concept of Peugeot Aureon has been picked from a similar looking alien spaceship showcased in a movie earlier. 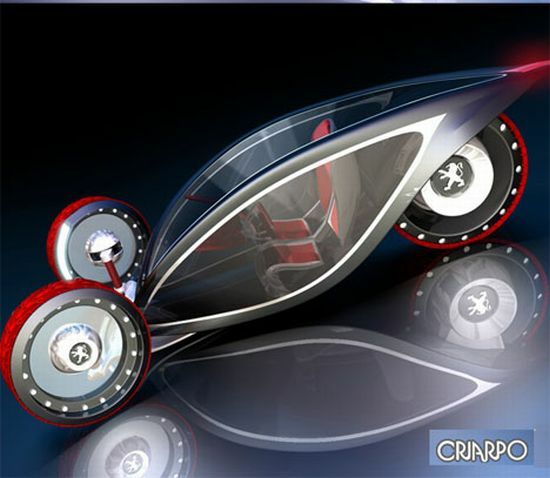 This conceptual automobile features all excellent futuristic characteristics. The first car that was born in 1885, and wheeled around in the streets was power steamed. This was made possible after a lot of experiments on the mechanism of the car and its engine. All this while, electric engines have been in development even though they were invented in the 1800s. If you have already guessed it, then bingo! 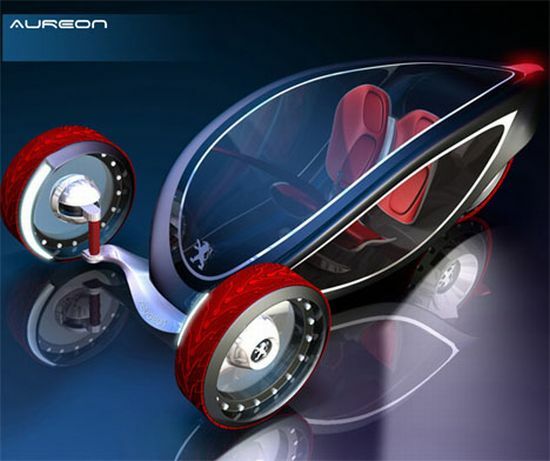 Peugeot Aureon comes with an electric motor housed in its jumbo rear wheel. By the way, the car will be running and performing extraordinarily on all ‘three’ of its wheels. Yes, you will find yourself driving around on three wheels soon, two in the front and a huge one at the rear. Also the tires are coated florescent red in color which would imitate or give a feeling of hot lava flowing, while on the run. Anyhow, a creature as simple as the ant was what inspired the creator to design the car. What contributes to making the car pull off a cutting edge design is the exceptional and ground-breaking lighting that includes the taillight and headlight and the light weightiness, thanks to the usage of carbon fiber. Also, the glossy and shimmering body of the car with the plastic hulk adds up to the classy feeling and the transparency gives you a clear view of the surrounding while seated inside. When the doors are open, the Peugeot Aureon absolutely resembles a dragonfly, which is ready to take off. The whole of last century, electric cars have not been popular due to their low speed and mileage gained when compared to fueled automobiles. But soon enough, all this will change since electric cars including the Peugeot Aureon will make a difference because of no polluting emissions and their economic feature. Hoping to see the car go from being just a concept to becoming a reality soon ! If this has managed to catch everyone’s attention, concepts such as Mack Truck, Trike Roadster and Moller Skycar M400 will definitely make a mark once these hit the roads!